I love what I do. I love capturing moments and I love hanging out with some of the best photographers and people you’ll ever meet. After going on hiatus for a few months and refreshing my creativity, I was happy to travel to Concord, North Carolina to cover the Carolina Rebellion music festival for the fourth straight year (other years: 2012, 2013, 2014). With my friends in tow, we made our way to the festival about an hour before doors. We had every intention of getting there well before Islander started to play at noon, but the horrific traffic patterns had different ideas. As we sat less than a mile away from our exit (in the exit lane, no less), we waited, and waited, and waited some more. Two hours later we were finally at the venue. What should’ve been a thirty-minute trip from our hotel took us nearly three hours in total. We had similar issues on day one last year before we found an alternate route. We had similar luck last year, too. Still, it’s something that event coordinators need to work on with State Troopers next year. No one should miss bands they paid money to see because of terrible traffic patterns and flow. After all was said and done, we’d missed Islander, We Are Harlot and Beartooth. That said, that was one of the only gripes I had with the festival. After the terrible rain debacle of 2013, the festival organizers have done a pretty solid job of putting on one of the most solid festivals in the US. I’ve never been a big fan of Stone Temple Pilots, or Scott Weiland for that matter, but over the course of my years attending concerts I’ve had the opportunity to see Weiland three times, including covering him twice. I saw Velvet Revolver back in the mid-2000’s at the height of their popularity, covered Stone Temple Pilots back in 2008 and now Scott Weiland as a solo artist. While his music has never really done much for me, I always appreciated how much of a showman he was. His energy and enthusiasm on stage was always something that I could appreciate despite not being a fan. However, there was very little in the way of effort from him at this show. In fact, he was flat-out boring. I had planned to stay for at least half of his set and I couldn’t stay past our third song. I hope this was just an off-day rather than a sign of things to come from him. Progressive metal band Periphery was easily one of the biggest and most enjoyable surprises of the weekend. I’d seen their new live music video for “The Bad Thing” (which was superb) and just felt compelled to check them out. They didn’t disappoint. Their crowd was madness, the band sounded impeccable and they definitely converted me into a new fan. I hope to see these guys on more metal and rock festivals. I’ve seen so many times over the last seven or eight years that I’ve lost count. Out in support of their new album Day of the Dead, Hollywood Undead put on one of the better sets of the weekend. They’re no strangers to Carolina Rebellion, being the last band that was willing to tough it out at Carolina Rebellion 2013, but this wasn’t your typical set from them. One of the biggest surprises was vocalist and guitarist J-Dog proposing to his long-time girlfriend Vanessa on stage as tens of thousands of people screamed in approval. Following the successful proposal, Hollywood Undead got down to business and finished their set without their signature masks. Despite seeing Papa Roach nearly twenty times (if I haven’t hit twenty already), I will never get sick of seeing them. Despite being an avid fan since their debut album Infest hit shelves, there are few rock bands that have maintained their live performance quality the way that Papa Roach has. Front man Jacoby Shaddix is top tier and the rest of the band follows his lead. While I wasn’t particularly fond of their set list selection for this show, it’s pretty standard for their festival dates. That said, festival organizers missed an opportunity for a cool collaboration by scheduling Papa Roach and In This Moment on separate days. Despite how terrible her vocals are, would’ve been cool to see Maria Brink come out to play “Gravity” with Papa Roach. Like most bands on this bill, I’ve seen Rise Against many times. I’ve actually seen them four times in the last calendar year, which might be the most I’ve seen one band in that time. I saw them at a DC 101 festival with A Day to Remember, Riot Fest 2014 and The Shindig 2014. Like The Shindig, vocalist Tim McIlrath just sounded off. The rest of the band was flawless and Tim certainly kept up his normal energy, but his voice sounded unusually off considering how good he usually is live. Some of it could’ve been the stage they were playing on, as the stage had terrible sound quality for most of the weekend – with few exceptions – but it sounded more off than that to me. Either way, I’d still highly recommend Rise Against to anyone who’s never seen them. Sammy Hagar has the epitome of what a rock star should be. Great voice, great energy on stage (especially for a sixty-seven year old!) and seems like a really cool dude to hang out with. Nowhere near the amount of drama that surrounds many of his former bandmates in Van Halen. Despite pulling a decent amount from his solo material, Hagar and company made use of their own personal back catalogues by covering songs from their Van Halen days as well as Led Zeppelin (John Bonham’s son Jason is Hagar’s drummer). Along with Cheap Trick, it was great to see Carolina Rebellion bring in some seasoned veterans that could change up the flow of the music for the day. I would love to see Rebellion and the other festivals from the World’s Loudest Month make more of an effort to include artists like this. I mean, come on, the festival is growing and expanding – you can’t tell me you can’t afford to throw money at Van Halen or someone of that nature. Make it happen! Marilyn Manson represents a better time in music in the United States. One where artists could push the envelope of what could be talked about or discussed. The days where artists would push people so far that they’d want them burned at the stake. I can’t remember many artists having more of a polarizing debate on free speech in America than Manson and Eminem. While Manson has softened a bit, he brought his normal flare for the dramatic to Carolina. While I had to miss most of his set in order to hustle over to cover Korn, Manson sounded better than I’d heard him in quite some time. I haven’t had the chance to listen to his new album yet, but I’m excited to give it a listen now. Long live offensive music. Like Papa Roach, I’m coming close to the twenty-times-seen plateau for Korn as well. Korn has a very special place in the hearts of the Rebellion faithful. 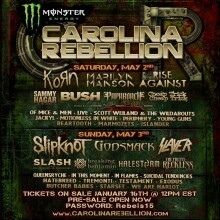 At Carolina Rebellion 2012, Korn ended their set with their hit “Blind”. Nothing too special about this, until former guitarist Brian “Head” Welch came out to play the song with them, his first performance with the band in eight years. Being a huge fan of Korn in my younger years (and only seeing them once with their original line up), it was truly a special thing to see the band put their past issues behind them and make this step forward. Not long after Head would rejoin the band and Korn show’s finally started to return to their normal level of awesome. To add a level of specialty to this show, Korn decided to play their 1994 self-titled debut album in its entirety (along with a few hits following it). It was amazing to hear so many songs I’ve never heard before (and will probably never hear again) with tens of thousands of other people screaming along with them. Hatebreed was easily one of the best bands of the weekend and it’s an absolute travesty that they had to not only play on the third stage, but essentially opened day two. Despite my issue with Hatebreed’s set time, they still put on a top three performance of the weekend for me. I loved the amount of songs they played off of 2002’s Perseverance, too. Here’s to hoping that we see Hatebreed at Carolina Rebellion again, and with a much better (and preferably longer) set time. Like Weiland (and In This Moment, who you’ll read about in a little bit), I’m not a fan of Butcher Babies’ music, but man are they great live. I’m very picky of the screaming voices I like in music, and especially so with female screaming vocalists. With the exception of Arch Enemy, OTEP and to a smaller extent Walls of Jericho, I haven’t enjoyed much in that regard. That said, vocalists Heidi and Carla have great stage presence and make photographing them very easy and enjoyable. I saw Suicidal Tendencies for the first time last year at Riot fest 2014, and I loved them. They were great back then, but they were on another level at Rebellion. Vocalist Mike Muir was a whirlwind on stage, and never even appeared to take a breath at any point during their set. The rest of the band was constantly running around the stage, trying to incite the crowd’s participation even more. They may not be the most household names on the bill, but they were easily one of the weekend’s best bands. I can’t stand In This Moment’s front woman Maria Brink. In fact, I think she’s easily one of the biggest jokes in rock. If it wasn’t bad enough that she does wardrobe changes between every song or the fact she sings with a headset microphone, every second of the set is choreographed. They had two back up dancers that would join Brink in synchronized dancing throughout the set (as well as doing their own dances as well). All of this together, I just can’t take the band seriously at all. Worst of all, she’s started forcing the rest of the band to stand further downstage, keeping them out of the publics view, making more room for Brink. The rest of the members of In This Moment seem like decent musicians (and the music is pretty solid), but Brink negates all the good they could do. How they’re as popular as they are is beyond my realm of comprehension. It’s been many years since I last saw Breaking Benjamin – five, to be precise. After a long hiatus, Benjamin Burnley and his new supporting cast of musicians are back in support of their new album Dark Before Dawn which is set to release on June 23, 2015. I was truly blown away by the response that Breaking Benjamin received. While I loved them and was happy to see them again after so long, their reception was incredible. Their set was packed to the brim (which caused major issues for photographers) and fans were screaming along for their entire set. Opening with “So Cold” and “Blow Me Away” certainly didn’t hurt. Slayer is easily one of the most iconic and notable bands in music, let alone metal. After the unfortunate and untimely death of guitarist Jeff Hanneman, the fate of Slayer seemed up in the air. Given the amount of member changes the bands gone through in their nearly-25 year history, my first though was that they’d continue – and continue they did. Despite Slayer making spine-breaking metal for the last twenty-four years, their live show has never been worth talking about. While thrash metal isn’t the sexiest of all metal genres, bands like Metallica and Anthrax have made great strides to not only perform well, but to show energy and get the crowd involved. Sadly, Slayer has never been much for showmanship. I appreciate their quality of performance, but a bit more energy and emotion would be appreciated. Slipknot is one of the greatest bands you’ll ever see as far as their show goes. While Corey Taylor and company always sound fantastic too, their live show is where they truly shine. Between the masks, the fire and their trio of drummers, they’re one of the best bands you’ll ever see. Their set list left a lot to be desired, but another solid performance from one of the best live bands around. To better view all photos, follow the link on the gallery below to link directly to Flickr.